In this post we share one story from two perspectives. 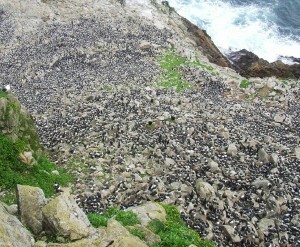 The first is from the perspective of a Common Murre at her breeding colony in “A Murre’s Day on the Rock”. The second is from the perspective of a fisherman on a charter boat, whose actions unwittingly impact the murre in a very important way in “A Beautiful Day on the Water”. 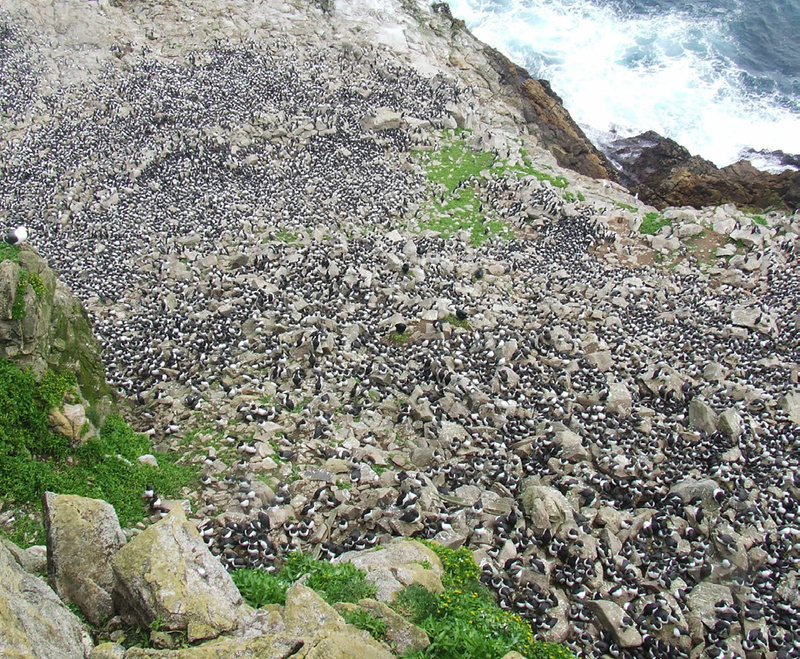 These stories were written by Mai Maheigan, Outreach Specialist, Seabird Protection Network. The murre stretched her head skyward and shook out her feathers as the sun’s rays began to warm her after the cool night. 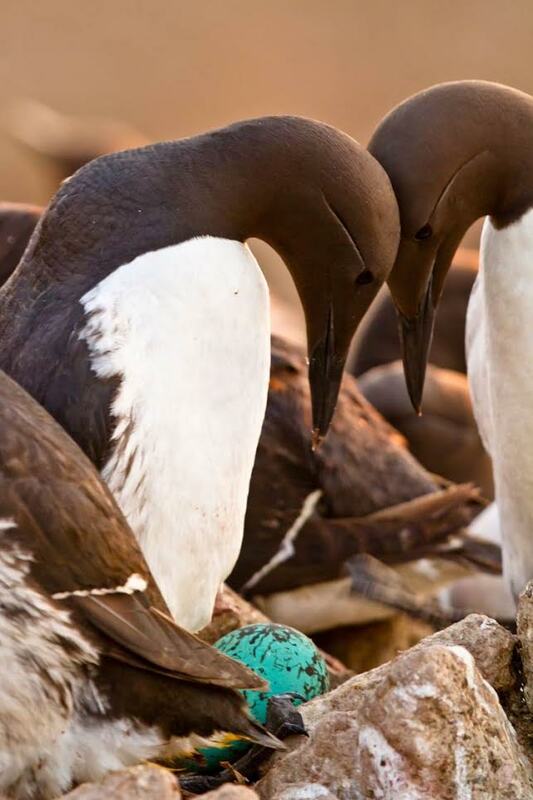 She then reached down and turned the speckled blue-green egg resting under her, using her bill to secure it near her warm belly. Neighbors began to wake around her and their closeness and movement gave the colony the look of rustling black fabric from the cliffs above. Only a few days more and the egg that she and her mate had cared for so solicitously would break open and reveal the fluffy black and white chick waiting inside. Then it would be time to increase her foraging trips and stuff her chick full of anchovy and small squid in the weeks before it left the safety of the colony for the sea. At this point she would be long gone, out to sea with the other females, feeding and rebuilding her fat stores after all of the resources she put into growing her egg and keeping it safe on this rocky outpost. She was not entirely relaxed, even now. She was a seabird, at home on the ocean, and uneasy with her feet on hard ground rather than in the soft fluid world. There were too many unfamiliar and frightening sights and sounds here on land. And their intrusion often left her restless and on edge, vulnerable. Just as her heart was quickening to the pull of the sea she felt a small tremor from the big blue-green egg at her feet. That is why she was here on this hard rock. Only a few weeks more before she again felt the wind of the open ocean and could fly, float, and dive as much as she liked, and eat to refill her perpetually hungry belly. She stretched her wings again and began to preen, checking that each of her feathers was in good shape and lay smoothly against the others. Just then she heard the call of her mate, and saw him coming in to land in the mass of birds, nearly on top of one, then settle in to make his way over to her. They spent a few short moments getting reacquainted, preening one another’s head feathers. Then she carefully inched her way off the precious egg, to let him cradle it and take over the job of keeping their yet-to-hatch chick safe and warm. Suddenly a loud noise startled her and every bird’s eyes turned in fright towards the sea as an enormous shape sped towards the rock. It was so terrifying that she immediately forgot everything except the fear that had overcome her. Along with many of her neighbors, she spread her wings and flew off the rock to the safety of the sea. A few minutes later she landed on the familiar sea and caught her breath, her heart still pumping from adrenaline and fear. She shook out her feathers and preened a few back into place. Floating quietly, she was able to gather her senses, and feel the familiar water beneath her slowly paddling feet. She caught the silvery glimpse of an anchovy and dove to pursue it under the surface; she caught and ate the first one then two more in quick succession. Her hunger now eased, she returned to the surface to float and rest. Her thoughts then returned to the rock and to her egg. Her egg! Was it safe? He paced the dock as he waited for the other passengers to load their numerous fishing poles, daypacks, and coolers, while the crew readied the boat for departure. The morning was brightening and he was looking forward to the promised calm seas and returning to one of his favorite nearshore rockfish spots on the outer coast. It had been too long since he was last on the water. His freezer was nearly empty. Jason stifled a yawn. 3:30 AM was a bit earlier than his usual wakeup time but he hadn’t wanted to be late for the boat’s dawn departure from Emeryville. He was always excited to go fishing. The other passengers had finally gotten everything on the boat. He re-boarded and rearranged his gear, getting it ready for his first cast. As the boat pulled away from the dock, he half-listened to the safety briefing, glancing over to where the lifejackets were stored. The sun started to glint off the bay. Jason put on his sunglasses. 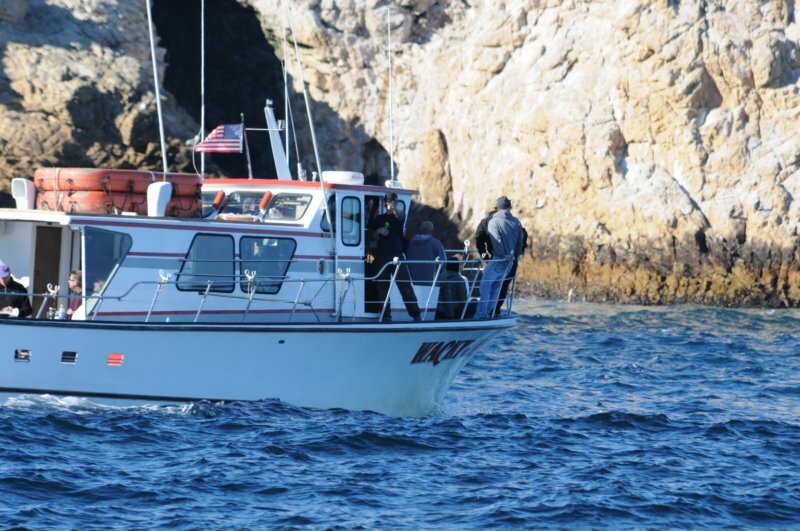 It would be a bit of a motor out to the fishing spot, just south of Pacifica, and a good spot for the rockfish they wanted to find today. They passed under the Golden Gate Bridge and the waves became stronger. He reached out to hold a railing, taking care not to spill his coffee. The outer coast was always rougher than the bay.